As soon as we found out we were expecting the arrival of sweet Baby K in March, it was pretty easy to start dreaming about a nursery and pinning away like a mad woman. Over the course of the last three years in our home, I've really enjoyed figuring out my style and tackling fun, affordable projects like our rustic dining room. But now, with baby on board, it's time to plan out what will surely be one of my favorite projects ever. In case you missed it, we've decided to wait to find out our baby's gender. (You can read more about that here.) There are tons of amazing reasons we are happy to wait a little longer for that sweet surprise, but it does mean that our nursery will be gender neutral. And you know what? We're a-okay with that, especially since it means we will decorate once for baby and then be able to use the room for all our future kiddos! I honestly think I would want to do more neutral nursery even if we were going to find out the gender of our sweet nugget. 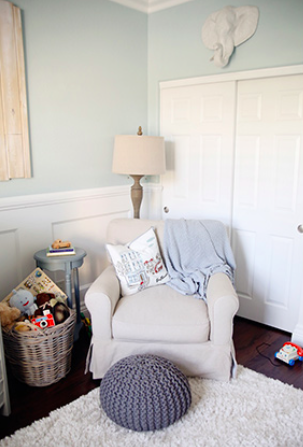 Our baby room is already a pale blue gray, which I love and think will work just fine, especially as we pull in pale grays and whites (like the color scheme in the nursery above from Style Me Pretty . 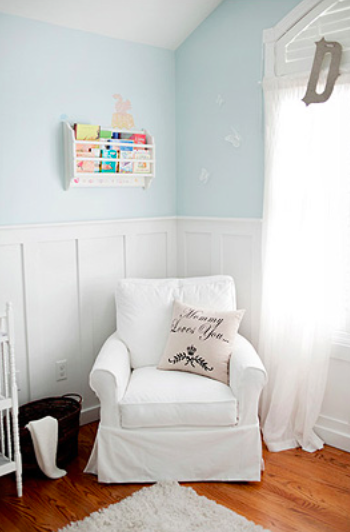 I'm still debating whether or not we want to paint the trim white, and/or go with some sort of white wainscoting or batten board on the lower half of the walls, like these dreamy set ups from The Little Umbrella and 100 Layer Cake-let. Thoughts? The plan is to go with some sort of travel/map/adventure theme that will allow us to incorporate little elements from all of our adventures together. We have several fun prints and souvenirs from our trips to Europe, and we plan to use those throughout the room. Think vintage suitcases, globes, and maps in pale whites, greens, and grays. 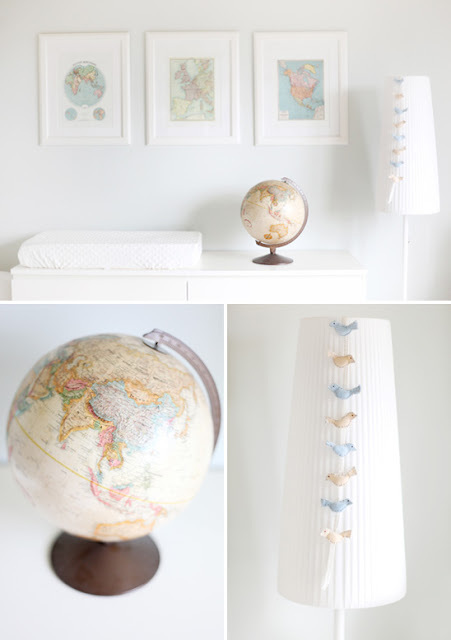 I'm slightly obsessed with this crisp, dreamy travel room from The Little Umbrella. Isn't it gorgeous? In addition to the fun, crisp photos and mini-globes, I'm dreaming of a few super cute signs and lettering to pull the room together. We've already picked up an "Adventure Awaits" map sign in the perfect shade of blue from TJ Maxx, as well as a sweet little globe. 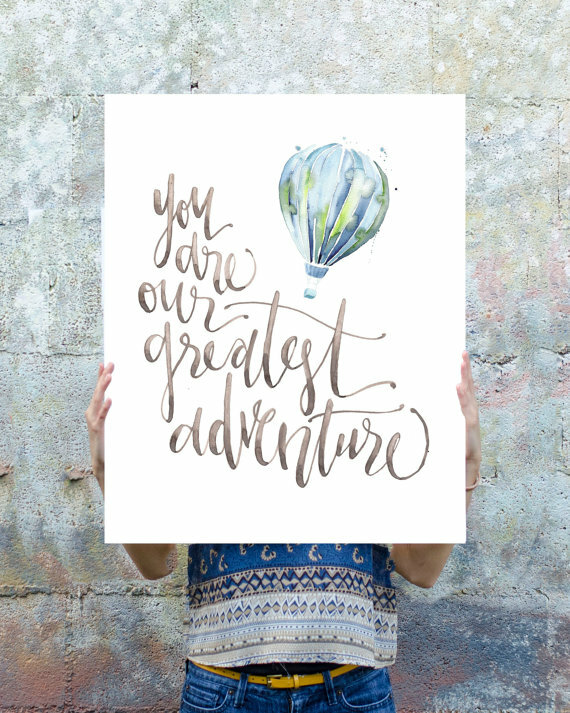 I'm also in love with this hot air balloon sign from WinsomeEasel. Finally, I'm on the hunt for a super cute, pale white, gray, and green mobile of some sort. 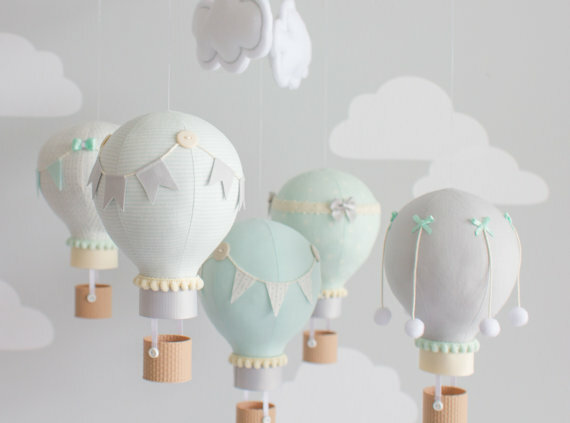 I seriously love this dreamy hot air balloon mobile from sunshineandvodka. Although I'm not sure I could take the leap and splurge on it, it's giving me some great ideas to start with. All in all, I'm loving the process of nursery planning and dreaming without any pressure. Knowing that this room will be used for all of our sweet babies just encourages me to take my time and have fun finding a few little pieces at a time. I'm still pinning lots of dreamy nurseries to my Pinterest Board, so be sure to go check it out! What are your favorites from these ideas? How have you styled your gender neutral nursery? If you aren't already, be sure to follow along on Facebook and Instagram for updates and the latest posts! I love the travel/adventure theme! That was a front runner for me with Q's nursery. The walls in all our bedrooms are pale gray and I love how easy it makes it to switch our rooms around. You won't regret going with an adorable neutral theme. 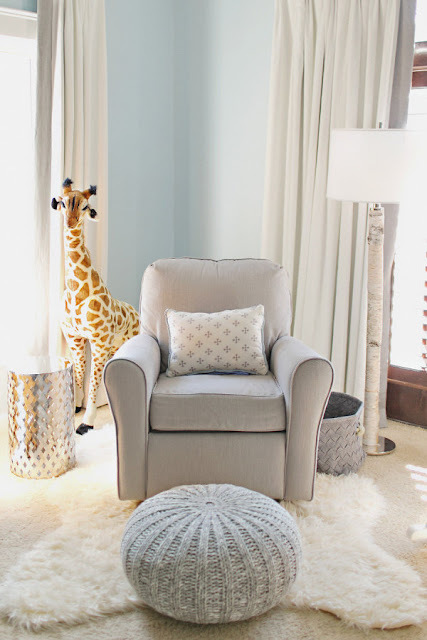 I love everything about this, especially the giraffe and the gray chair! I love that gray chair so much!! I'm not sure yet what chair we will get, but I love that look. I think they are all super lovely ideas. So soft and cozy. Thanks so much, Hollie! We certainly think so! I am loving these inspirations. They are so comfortable looking and i also love the light colors as not to overwhelm baby. Congratulations! Thank you, Abbey! I love them too! YAY!!! We waited to find out with BOTH of our children, and I wouldn't have had it any other way! We did the nursery and grey and yellow. You have some sweet ideas here. Perfect for any baby. Lucky to have you as it's momma! Oh YAY! That's so good to hear! I know it's not the norm these days, but we are excited about it. And thank you SO much for your kind words!! You sound like an awesome momma! Love the inspiration you are pulling from! I love wainscoting! If you are working on a budget then you may want to skip it. If not go for it! This is so gorgeous! Gone are the days you had to plaster pink or blue all over a nursery. Gender neutral designs are so classy and sophisticated and can grow with your child. Thanks for sharing! Agreed! Thanks so much, Luna! I have always done fairly gender neutral nurseries even though I've known the genders. We are expecting our first boy and I've always wanted to do maps for a boy's nursery. I can't decide if I like it that the adventure theme is so popular right now or not. Haha! It makes it easier to find pieces for a nursery, but I also see a lot more adventure nurseries and I'm funny about being trendy. Haha! That sounds like such a smart plan! It is trendy right now, and I know what you mean about not always wanting to do trendy ha! It will be hard when we go to the ultrasound, but ultimately I am looking forward to it! Thanks for reading! Designing my baby's nursery was seriously the most fun I've ever had! It is now my favorite room in the house!! I was just like you, pinning away as soon as I found out I was pregnant. I went with a gender neutral room even though we found out the gender of our baby. Your nursery theme is so cute!! Congrats and good luck getting it all together before baby arrives! Aww, I love that! Sound like gender neutral nurseries are the way to go! Thanks so much for your kind words. So cute! I pinned so many nursery ideas and we finally have the room almost all together! We didn't go gender neutral, but we thought about it! Oh yay!! I can't wait to see how it turns out! Love this room! I could never wait to find out -- I would be WAY to excited. I am really bad at waiting for surprises. Drives my husband nuts! LOL. Haha, I know just what you mean. I have some friends who are the same way! Those are such adorable ideas. I LOVE that barely-there wall color. So pretty! I love it too! Just subtle enough but not quite white. This is absolutely adorable! I have a whole Pinterest board full of nursery inspiration haha lately, it's my most pinned board too. I like the idea of gender nutural nurseries. You are the bomb, Keating. I love pinning to my nursery board too! I love the neutral colors in your nursery. I'm a big fan of gray / yellow / white in a nursery. It's so clean and peaceful. You did a fantastic job. Thank you, Ashley! Yes, I love that combo as well. We are looking forward to decorating! How adorable! I have a pinterest board full of future nursery ideas. Me too!! I think I started my board a couple years ago ha! 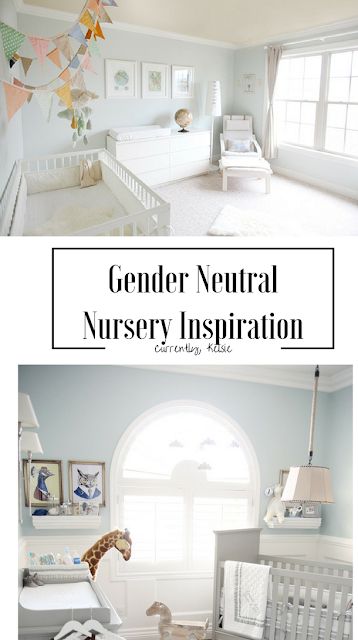 I love the idea of a gender neutral nursery. I'm big on neutral colors so this is definitely something to keep in mind for the future. That's so fun! We ended up with a gray crib too and I love it! I am doing a similar theme for my gender neutral nursery and bought the poster from Windsome Easel on Etsy. Do you suggest framing it? The image you show has it straightened out (can't tell what it's mounted on), but she sends it in a tube so I need to figure out how to hang it. Thanks!